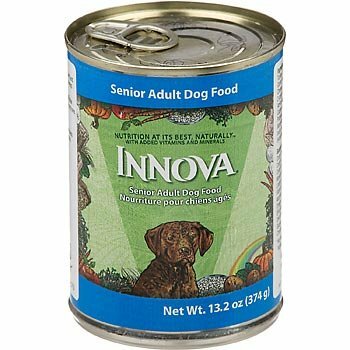 Healthy Variety for your Older Dog Innova Senior Canned provides all of the fresh, healthy ingredients of Innova Senior Dry food in a can, for older dogs who prefer moist food. After laying the foundation for good health in later years with ingredients from the five basic food groups, Innova Senior also includes Vitamin E, additional natural fiber to aid digestion, and reduced protein and fat to control weight. 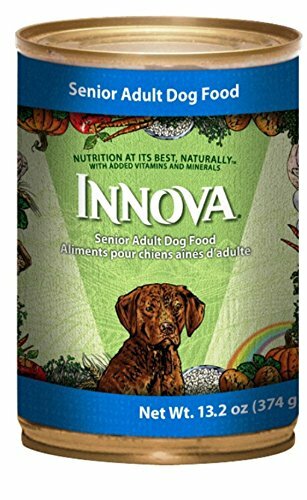 Innova Senior is the first food in the industry for older dogs that includes the dietary supplements Chondroitin Sulfate and Glucosamine, believed to help rebuild cartilage and ease the pain of osteoarthritis. Geriatric dogs have special needs. Like us, your dog can suffer from age-related problems such as: weaker immune system, less efficient digestive system, reduced nutritional needs and osteoarthritis. 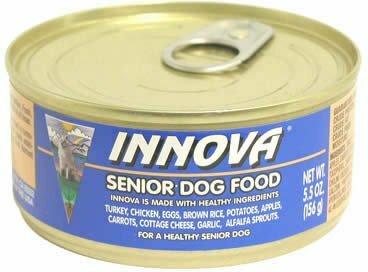 Innova Senior is unlike any senior dog food on the market today. Most senior diets just contain less protein and fat with added fiber. Innova Senior goes beyond that in its formulation with the total aging process in mind. 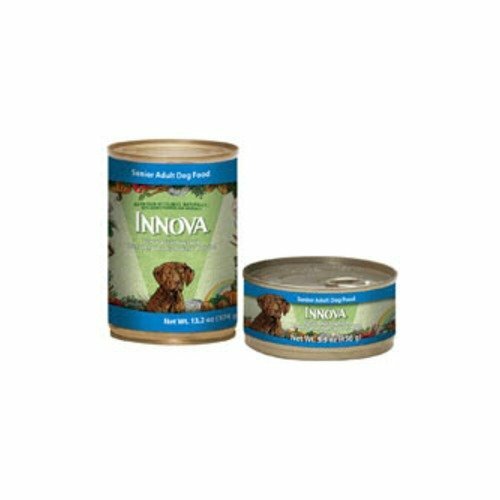 INNOVA SENIOR canned Dog Food is formulated to meet the nutritional levels established by the AAFCO Dog Food Nutrient profiles for maintenance. 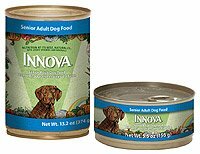 Innova Senior Canned is available in 5.5 ounce and 13.2 ounce cans. 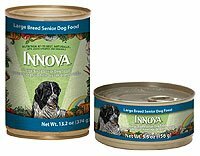 Innova Large Breed Senior Canned Dog Food, 13.2-oz, case of 12; Innova was the first true holistic health food for pets. Made with wholesome and natural ingredients, Innova provides complete and balanced nutrition for optimal health at every life stage. Innova Large Breed Senior Dog Food is formulated as a transition diet for large or giant breeds who age more quickly and are therefore considered seniors when they’re as young as six years old. 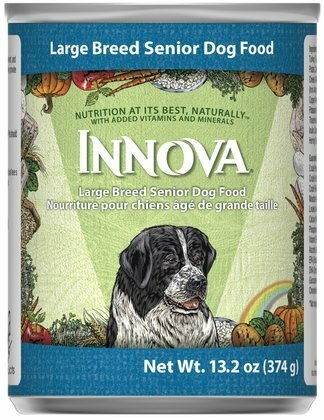 Innova Large Breed Senior Dog Food has more protein and slightly less calories than Innova Large Breed Adult Dog Food to help maintain your dog’s lean body as he or she ages while glucosamine and chondroitin sulfate have been added to help maintain healthy joints and cartilage. 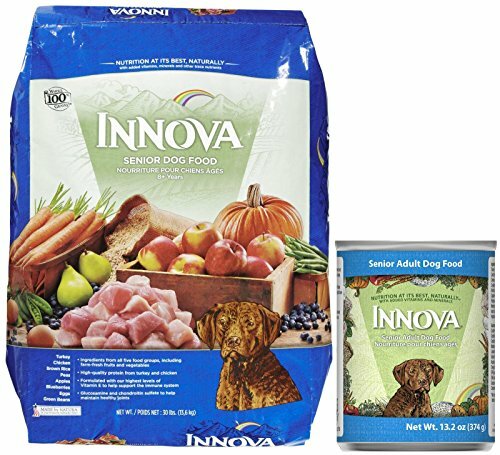 Innova Large Breed Senior Dog Food provides complete and balanced nutrition for maintenance. Key Benefits Great taste dogs love Complete and balanced nutrition for large and giant breed seniors Glucosamine and chondroitin sulfate added for joint health Contain wholesome, healthful fruits and vegetables like apples and carrots With EPA and DHA special omega-3 fatty acids important in eye and brain development Pumpkin, a "SuperFood," is a fantastic source of antioxidants Elements from the five food groups - meat, dairy, vegetables, fruit and grain - plus essential fats and oils to deliver supreme nutrition Made in the USA!